Here at Throstlenest we know just how important saddle fittings are for your horse. After all, comfort is the key to success, and can ensure that you and your horse can perform to the best of your abilities. So why is getting a saddle fitting/ saddle check so important? Whether you are buying your horse's first ever saddle or fifteenth saddle, it is equally as important to get the saddle properly fitted each time. Even once you have bought your saddle, you should continue to get it checked to ensure it still remains the perfect shape for your horse's current form. Although this may seem unnecessary, horses actually change shape all the time depending on their weight, fitness and musculature. Even the time of year largely effects their shape, as they tend to drop weight and fitness levels in the colder, winter months. 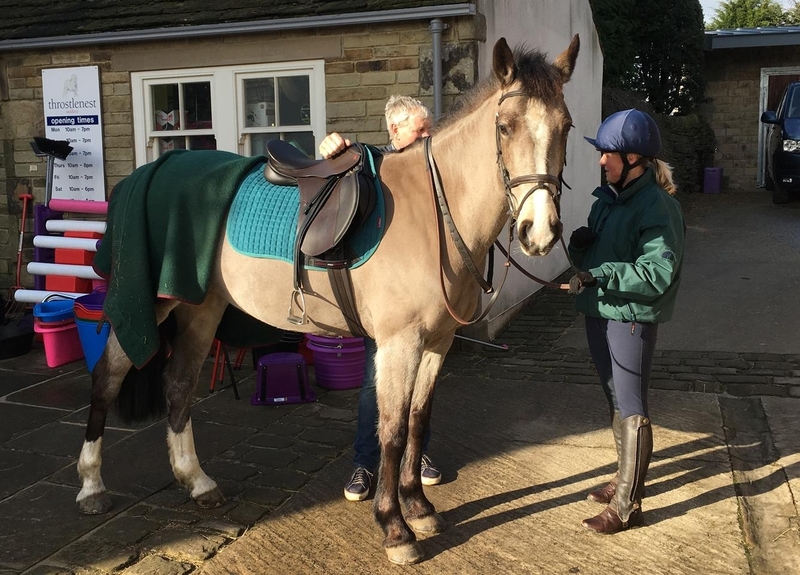 The benefits of having a correctly fitted saddle, are that you'll be able to ensure your horse is comfortable, has completely unrestricted freedom to move, and also has the ability to develop the correct muscles. You should also ensure that you have the right saddle for your riding style and body shape, as your height and form can effect how you're balanced in the saddle, and if you are 'in the way' of your horse. On the other hand, if you are riding with an incorrectly fitted saddle, there are risks of your horse developing back muscle asymmetry, a stilted gait and most frequently back pain. The fit of the saddle can even effect the rider, as recent studies have associated ill-fitting saddles with back pain in riders. How often should I get my saddle checked? It is recommend that once you have purchased a saddle, you should participate in saddle checks every three to six months depending on how the horse changes shape and his work schedule. Where can I get my saddle fitted? If you are looking at purchasing a saddle, or getting your current saddle checked, Throstlenest Saddlery owner David is an expert saddle fitter. Here at Throstlenest we have all the facilities for those wanting to bring their horses in for a saddle fitting, and are always happy to meet new visitors which we reguarly do! If not, don't worry as we can also arrange home visits for those who can't get their horses down to us easily. To discuss your options with David and book a saddle fitting or saddle check appointment, or simply to ask any enquiries you may have, simply give us a call on 01226 790497 or email us at info@throstlenestsaddlery.co.uk. Our expert staff are always happy to help!